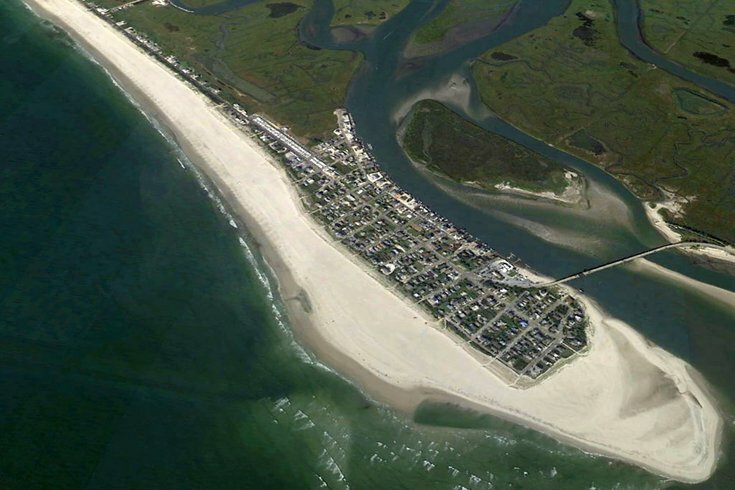 Strathmere, between Ocean City and Sea Isle City, is one of the few Jersey Shore towns that offers free public access to oceanfront beaches monitored by lifeguards. Strathmere will be a little bit more easily accessible this summer from the north, which is good news for those who frequent the south end of Ocean City and are perhaps escaping to a town where they can actually buy an alcoholic beverage. It'll be easier to get to this tiny beachfront portion of Upper Township because beginning this week, the Corson's Inlet Bridge leading into Strathmere accepts E-Z Pass ... another vestige of Jersey Shore lore lost. Strathmere has been part of Upper Township since 1905, when it was annexed from Sea Isle City for $31,500 as part of a deal that allowed Sea Isle to unload some municipal debt. About 100 years later, a group of Strathmere residents — there are fewer than 200 who list the island as their primary residence — mounted a campaign to secede Strathmere from Upper Township and rejoin the island with Sea Isle City. But that bid ended in 2012 when an appellate court upheld and earlier decision by the New Jersey Superior Court that blocked the seccesion move petitioned by the Citizens for Strathmere and Whale Beach. Then in January 2013, the New Jersey Supreme Court denied the group’s final appeal, and the movement ended. Below is the latest weather forecast for Strathmere, New Jersey, and here are the latest surf reports from Sherman Avenue and Prescott Road beaches. No beach tags required in Strathmere. May 29-June 1: Lifeguards dispatched as needed between 10 a.m.-6 p.m.
June 4-8: Lifeguards dispatched as needed between 10 a.m.-6 p.m.
June 9: Lifeguards dispatched as needed between 10 a.m.-11 a.m.
June 11–15: Lifeuards dispatched as needed between 10 a.m.- 6 p.m.
Green: Mild conditions, low risk of rip currents, still swim with caution. Yellow: Moderate conditions, moderate risk for rip currents, swimmers should enter the water with caution. The Upper Township Beach Patrol's headquarters are on Williams Road in Strathmere. For more information call (609) 263-1151. There will be no beach parties, fires, motor vehicles, alcoholic beverages nor will sunbathers change their clothing on the beach in Strathmere, and dogs are prohibited on the beach from May to September. Surfing is allowed south of Tecumseh Street and north of Sherman Street. Lifeguards can allow surfing between other protected beaches pending the conditions of the ocean. Fishing is permitted south of Prescott Street and north of Seacliff Street, and also at the discretion of lifeguards, fishing may be permitted between other protected beaches depending on the conditions. More information about Strathmere's beaches can be found here. Street parking is available and free. Observe restrictions noted on posted signs. If fishing is your thing, Strathmere is the site of several fishing tournaments this summer. The Strathmere Fishing and Environmental Club will be hosting the Herb Hollinger Sr. Opening Day Flounder Tournament on May 26. Then June 2, the organization's Summer Flounder Tournament will take place, and on June 16 the Jane Shelter and Debbie Starr Women's Fishing Tournament will take place. Strathmere's Deauville Inn is a popular destination for shore-goers whether they're staying in Strathmere or not. The large restaurant and bar at the foot of Corson's Inlet Bridge features waterside drinks and dining on its covered deck as well as in the sand on beach chairs under umbrellas. Here is the calendar for the Deauville's live entertainment. Nearby Twisties on the Bay – which according to legend operated as a speakeasy from 1929 to 1933 and was visited by Al Capone – is another option for food and drinks. For more to do in Strathmere and Upper Township, check out the blog Strathmere News & Happenings and the Upper Township events calendar.